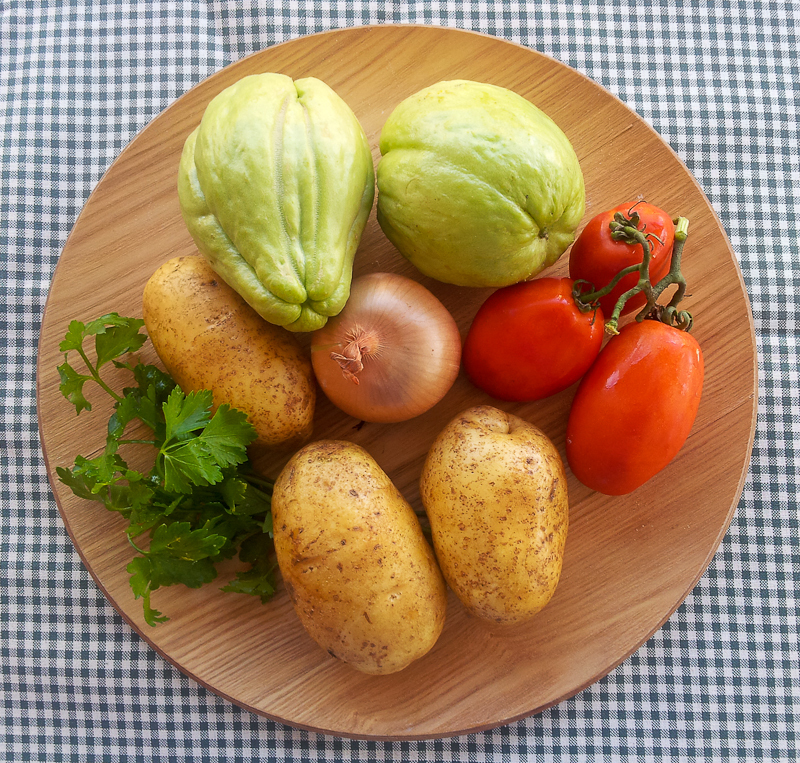 Never heard of chayote before? Well, neither had I until today. That’s not to say I haven’t eaten it, though. You see, this is a vegetable (botanically speaking, a fruit) I discovered here in Sicily. “Chayote for dinner today, kids!” is not something I seem to remember my mother calling out, so for me it’s always only been zucchina spinosa. I’ve never needed to know what it’s called in English before now. If you want to get technical, its Latin name is Sechium edule, and it’s related to melons, cucumbers and squash. As you can see from the photo, it’s not particularly appealing, looking as it does like an anaemic, corrugated avocado. To make matters worse, these vegetables are also often covered in soft barbs, making them resemble light green hedgehogs. Taste-wise they’re pretty similar to their cousins, cucumbers. In other words, fresh and delicate. Or, not to put too fine a point on it, boring. But boring is just what I want sometimes. No, I’ll take that back; boring is going too far. Food need never be boring. What I mean is soothing and unexciting. No, that doesn’t sound right either, does it? Let’s just say that chayote soup is the food equivalent of a pat on the back from a friend. Heart-warming, rather than thrilling. And there are times when that’s what you need. You don’t necessarily want hours of unbridled passion with Marion Cotillard every night. Sometimes you could simply do with a pat on the back from a friend, right? I’m trying really hard to convince myself here, and failing miserably. Anyway, the point is, as the more observant will have gathered from the photo, things are a bit low-key today. No spleen fried in lard to delight your taste buds, no barbecued sheep’s guts. In fact, what you see before you, apart from some pasta and a final drizzle of oil, are all the ingredients for today’s dish. That’s your lot. Basically, I was looking for something hot, easy and nutritious, something that would make me feel righteous after a week of sat fat overdrive. And zucchine spinose will make you feel very righteous indeed, with their diuretic, cardiovascular and anti-inflammatory properties. Whether or not they’re easy to find in your local supermarket, I don’t know, but I imagine that a decent Asian grocer might well have them, seeing as they are popular in India, Thailand, Indonesia and the Philippines. The BBC Food site also says that “chayote are sold in West Indian shops in the UK“. You could actually leave out the pasta and just have this as an unadulterated soup, if you’re feeling really virtuous. Personally, I was already feeling virtuous enough. Ah, there’s no photo of the finished dish, I’m afraid. Nigella probably could have made it photogenic, but it was beyond me. Put the chayotes, potatoes and onions in the boiling stock and simmer for 20 minutes. Add the tomatoes, parsley, and pasta (if using). Bring to the boil and continue cooking, stirring occasionally, for further 10-15 minutes, until the pasta is ready. Ladle into soup bowls and drizzle over some good olive oil. Chilli flakes and grated parmesan also go well. Slurp it up and then fall asleep in front of the TV, with a friend. This entry was posted in Ingredients, Recipes, Soups, Vegetables & side dishes and tagged chayote, soup, zucchina spinosa by hungryenglishman. Bookmark the permalink.